Oxford-educated historian Joseph P. Farrell really delivers in this latest addition to his best-selling book series on suppressed technology, Nazi survival and postwar hidden conflicts. His customary meticulous research and sharp analysis blow the lid off of a worldwide web of nefarious financial and technological control few people even suspect exists. Farrell delves into the creation of a breakaway civilization by the Nazis in South America and other parts of the world. He discusses the advanced technology that they took with them at the “end” of World War II and the psychological war that they waged for decades against America and NATO. He shows how the breakaway civilization has created a huge system of hidden finance with the involvement of the Vatican Bank (among others), and how NATO established a large covert warfare network and political slush fund. He investigates the secret space programs currently sponsored by the breakaway civilization and the current militaries in control of planet Earth. Farrell includes a fascinating discussion of “emulational” technologies (those that can manipulate acts of god/nature, like earthquakes and storms) from the standpoint of the culture of “full spectrum dominance” and the culture of “plausible deniability”—yes, there are plans for mass destruction that can never be traced back to their real source. 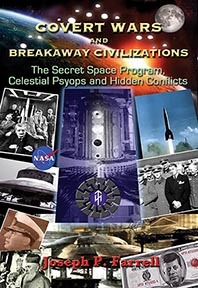 Farrell also discusses the historical origin of the breakaway civilization with the continuing airship mystery; incredibly bold counterfeiting operations; and the nexus of spy satellites, nuclear weapons and UFOs. He includes plenty of astounding accounts, documents and speculation on the amazing alternative history of hidden conflicts, secret super-finance and technology.